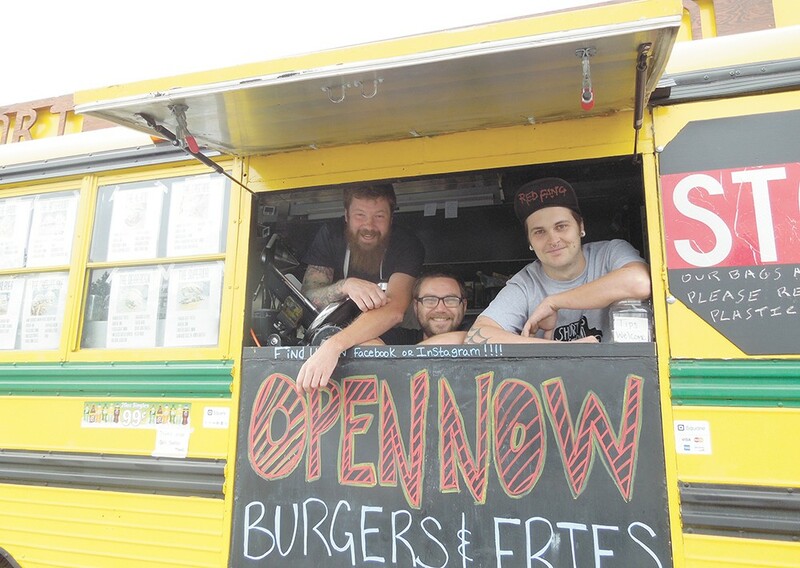 Short Bus Bistro co-owners, from left to right, Justin Dennis, Richard Reidt and Chris Crow spent years retrofitting the bus’s kitchen. The converted school bus just showed up one day in early June, and it hasn't left its parking spot near the corner of Rowan and Maple since, catching the eyes and tempting the hungry stomachs of northbound commuters with its mustard-yellow paint and a wooden sign along the top emblazoned with its name — Short Bus Bistro. The newly debuted burgers-and-fries food truck — or, rather, food bus — is the result of an ongoing project by four Spokane friends who spent more than two-and-a-half years retrofitting the bus they bought from a Tri-Cities church. For now, thanks to an agreement with owners of the S & B Mart gas station and convenience store where it's parked, Short Bus Bistro has a semi-permanent home on the north end of the Shadle neighborhood. Its business partners have close ties to the surrounding area, having converted the vehicle into a full-sized commercial kitchen just blocks away. "We love the Shadle area, and the idea is to provide a good neighborhood food truck that people know is going to be around, and they can come get lunch here," says co-owner Richard Reidt, who developed Short Bus Bistro's menu of gourmet-style burgers and sandwiches. Reidt also works in dining services at the Mukogawa Institute in Spokane, and has gained culinary experience from traveling around the world. He and the rest of the business' four-man team — consisting of Justin Dennis, Chris Crow and Adam Bellotty — split their time between working the food truck, which also offers catering services, and other day jobs. Short Bus Bistro's concise menu of nine burgers and chicken sandwiches ($8) are each named after the respective culinary regions in the U.S. they were inspired by. There's the Bitterroot, after the Northwest mountain region, with blueberry sauce, peppered bacon, toasted marshmallow, mayo and fresh onion atop a Yakima-raised beef patty. Paying homage to the South is the Bayou, with Cajun-seasoned fried chicken; and the Alamo is a tribute to Texas with housemade barbecue sauce and pickles. Other sandwiches take after Midwest and Hawaiian cuisine. For those who want to keep their burger simple, the Classic sticks to its roots with onion, pickles, cheese, ketchup and mustard ($5). You can add fries to all orders for an extra $2, or add a larger side order for $4.